At Charmed Border Collies we don't have kennels. We take great pride and joy in raising our puppies in our home. They are raised around children and exposed to all kinds of positive social and mentally stimulating experiences. All of my pets are given the love, attention and exercise that they so lovingly need and deserve. They are raised naturally on a healthy raw diet. I give minimal vaccinations and use No toxic chemicals in my home or in my yard. Loving temperament and good health is the utmost important goal. 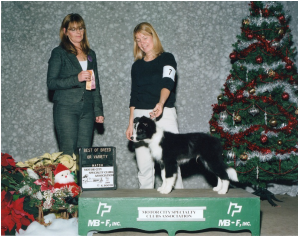 Our puppies are breed from generations of show dogs and make the perfect companion and versatile competitors.